•Selecting this option will truncate the downstream reach at a junction if a change in source ID occurs. •You may want to enable this option if for example you are analysing sinuosity. If the site you are analysing happens to be on a smaller tributary near a junction then the downstream reach is likely to end up on the larger main stem. In RivEX source ID is the path to the furthest point upstream and is a proxy for catchment size. Thus trying to relate site statistics for a smaller river using a downstream reach length partially based upon a larger river is unlikely to yield sensible or reliable results. •Sinuosity is one such channel metric that can be influenced by where the reach ends. Other metrics would also be influenced: for example channel width may be larger, elevation could be significantly different which would influence any gradient calculations and zones of impact downstream of structures may diminish as the river flows into a larger more dominant channel. This option to clip to source ID gives you the chance to explore such scenarios. •In the example image below 3 sites were processed to create downstream reaches 500 m long, Clip to source ID had been ticked on. The network is labelled with source ID, at this point within the catchment the main stem would be 653. The purple site only achieves a downstream reach length of 149m before there is a change in source ID (from 521 to 520). 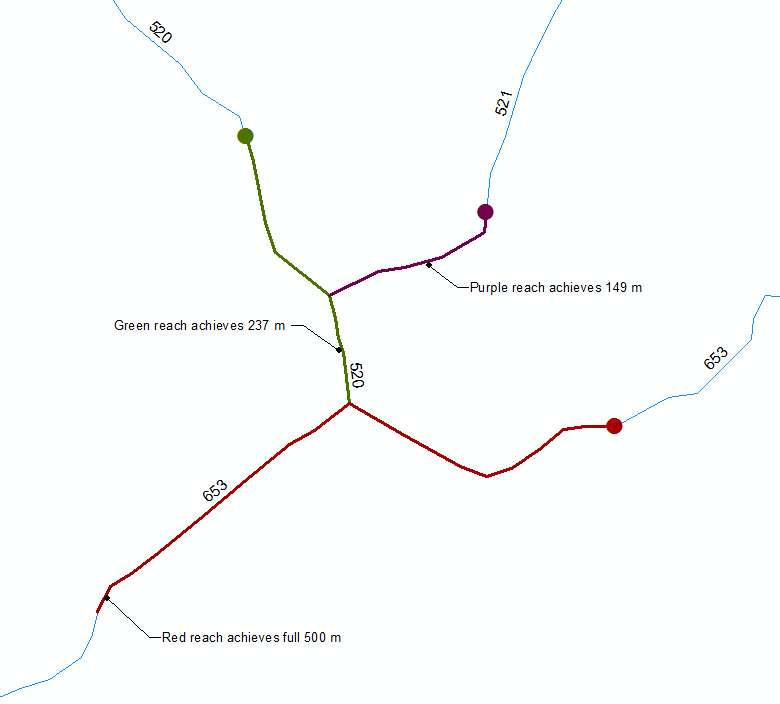 Green is able to travel a little further and only red is able to create the full desired length of 500 m as the reach is still on the source ID that the site is on. Clipping to source ID influencing the downstream reach length. •As an example of how the final length of the reach can influence analyses; the Purple reach sinuosity is 1.063 as it terminated at the junction, if it had travelled the full 500 m its sinuosity would have been 1.136.